Origen of Alexandria, one of the greatest Christian theologians, is famous for composing the seminal work of Christian Neoplatonism, his treatise On First Principles. Origen lived through a turbulent period of the Christian Church, when persecution was wide-spread and little or no doctrinal consensus existed among the various regional churches. In this environment, Gnosticism flourished, and Origen was the first truly philosophical thinker to turn his hand not only to a refutation of Gnosticism, but to offer an alternative Christian system that was more rigorous and philosophically respectable than the mythological speculations of the various Gnostic sects. Origen was also an astute critic of the pagan philosophy of his era, yet he also learned much from it, and adapted its most useful and edifying teachings to a grand elucidation of the Christian faith. Porphyry (the illustrious student of Plotinus), though a tenacious adversary of Christianity, nevertheless grudgingly admitted Origen's mastery of the Greek philosophical tradition. Although Origen did go on to compose numerous biblical commentaries and sermons, his importance for the history of philosophy rests mainly on two works, the systematic treatise On First Principles, and his response to the pagan philosopher Celsus' attack on Christianity, the treatise Against Celsus. Since the purpose of this article is to introduce students and interested laypersons to the philosophy of Origen, it will be necessary to focus mainly on the treatise On First Principles, which is the most systematic and philosophical of Origen's numerous writings. In this work Origen establishes his main doctrines, including that of the Holy Trinity (based upon standard Middle Platonic triadic emanation schemas); the pre-existence and fall of souls; multiple ages and transmigration of souls; and the eventual restoration of all souls to a state of dynamic perfection in proximity to the godhead. He is unique among Platonists of his era for introducing history into his cosmological and metaphysical speculations, and his insistence on the absolute freedom of each and every soul, thereby denying the fatalism that so often found its way into the more esoteric teachings of the various philosophical and mystery schools of his day. Origen was, according to Eusebius, "not quite seventeen" when Septimius Severus' persecution of the Christians began "in the tenth year of [his] reign," (Ecclesiastical History; tr. Williamson, p. 179) which gives the approximate date of Origen's birth as 185/6 C.E. He died around the reign of Gallus, which places his death in 254/5 C.E. Origen lived during a turbulent period of the Roman Empire, when the barbarian invasions were sweeping across Europe, threatening the stability of the Roman Empire. His was also a time of periodic persecution against Christians, notably during the reigns of the Emperors Severus, Maximin, and Decius, so that Origen's life began and ended with persecution. His family was devoutly Christian, and likely highly educated; for his father, who died a martyr, made sure that Origen was schooled not only in biblical studies, but in Hellenistic education as well. Eusebius (Ecclesiastical History, tr. Williamson, p. 182) tells us that Origen was only seventeen when he took over as Headmaster (didaskalos) of the Christian Catechetical School at Alexandria. He became interested in Greek philosophy quite early in his life, studying for a while under Ammonius Saccas (the teacher of Plotinus) and amassing a large collection of philosophical texts. It is probably around this time that he began composing On First Principles. However, as he became ever more devoted to the Christian faith, he sold his library, abandoning, for a time, any contact with pagan Greek wisdom, though he would eventually return to secular studies (Greek philosophy), from which he derived no small measure of inspiration, as Porphyry (recorded in Eusebius) makes quite clear, as he continued with his ever more sophisticated elucidation of biblical texts. Origen's debt to Holy Scripture is obvious; he quotes the bible at great length, often drawing together seemingly disparate passages to make a profound theological point. Yet his thought is all the while informed by his Greek philosophical education, specifically that of the Middle Platonic tradition, notably the works of the Jewish Platonist Philo of Alexandria and the Neopythagorean philosopher Numenius of Apamea (fl. 150-176 C.E.). Origen shares with Philo an insistence on the free will of the person, a freedom that is direct evidence of humanity's likeness to God - for, like God's Being, human existence is free from all necessity. From Numenius, Origen likely adopted the conception of a "second god" proceeding from a first, ineffable being called the One, "First God," or Father. Numenius referred to this "second god" as Demiurge or craftsman, and taught that he created the cosmos by imitating the intellectual content of the "First God." Origen applied this basic notion to his doctrine of Christ, whom he also called Demiurge (Commentary on John 1.22), and went on to describe Christ as a reflection of the Truth of the Father, stating that compared to human beings Christ is Truth, but compared to the Father He is falsehood (Jerome, Epistle 92, quoting Origen; see also On First Principles 1.2.6). Another extremely important part of Origen's intellectual heritage is the concept of apokatastasis or "restoration of all things." This term first appears, as a philosophical concept, in the writings of the Stoics, whose materialistic pantheism led them to identify Zeus with the pure, "craftsmanly" fire pervading and constituting the cosmos. According to the Stoics, this fire expands and contracts according to a fixed cycle. They called the contraction a "conflagration" (ekpurôsis), destroying the cosmos, yet only temporarily. This contraction was described as Zeus returning to his own thoughts, to contemplate the eternal perfection of his mind/cosmos (the material cosmos being the expression of his mind, or Logos). The expansion would occur when Zeus once again expressed his mind in the creation of the material cosmos; this re-creation or reconstitution of the cosmos is what the Stoics called apokatastasis. Some Stoics argued that since Zeus is perfect mind, then every reconstitution of the cosmos will resemble identically the one that preceded it. This Stoic doctrine was to have an immense influence on the development of the so-called esoteric traditions in the Hellenistic era, notably the Hermetic school, Gnosticism, and astrology, with all of which Origen was, in varying degrees, familiar. In Origen's time, Christianity as a religion had not yet developed a system of theology as a basis of orthodoxy; therefore, in addition to a wide variety of opinions regarding the faith, there were also various sects, each claiming to possess the truth of the Christian faith. Foremost among these sects was the group of schools loosely labelled 'gnostic.' The Valentinian school (founded by Valentinus, an outstanding teacher and philosopher who was at one point a candidate for bishop of Rome) was the most philosophically accomplished of the Christian Gnostic sects. In his Commentary on John, Origen refutes the doctrines of a Valentinian Gnostic named Heracleon, who had earlier written a commentary on the same Gospel. While Origen's opposition to Gnosticism precluded any doctrinal influence, he saw in Gnosticism the value of a system, for it was precisely by virtue of their elaborate and self-consistent systems that the Gnostics were successful in gaining adherents. Since there were no non-Gnostic Christian theological systems in his day, it was up to Origen to formulate one. This was the program of his treatise On First Principles. 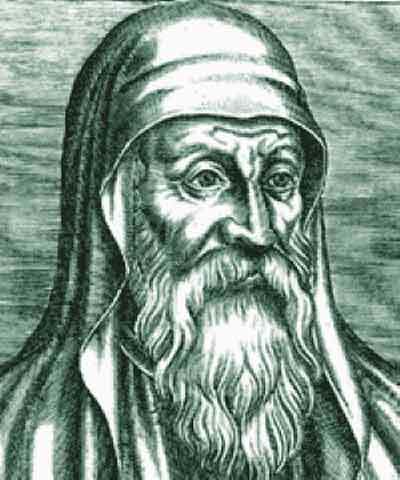 Origen was the first systematic theologian and philosopher of the Christian Church. Earlier Christian intellectuals had confined themselves to apologetic and moralizing works; notable among such writers is Clement of Alexandria (d. 215 C.E. ), who, like Origen, found much of value in Hellenic philosophy. Before proceeding with an examination of Origen's system, it must be noted that scholars are divided over the question of whether or not his On First Principles contains a system. Henri Crouzel (1989), for example, has argued that the presence of contradictory statements in certain portions of the treatise, as well as in other texts, is proof against the claim that Origen was presenting a system. Hans Jonas (1974), on the other hand, recognized a clear system in On First Principles and gave a convincing elucidation of such. The reason for this scholarly divide is mostly due to the lack of a precise definition of 'system' and 'systematic'. If one approaches Origen's text expecting a carefully worked-out system of philosophy in the manner of a Kant or a Hegel, one will be disappointed. However, if one reads the text with an eye for prominent themes and inner consistency of such themes with one another, a system does emerge. As John Dillon has pointed out, Origen succeeded in luring away several students of the renowned Platonic teacher Ammonius Saccas to study with him, and, Dillon convincingly observes, this would not have been possible if Origen did not have some system to offer (Dillon, in Kannengiesser, Petersen, ed. 1988, p. 216, and footnote). It must also be pointed out that the text of On First Principles that we possess is not complete. Origen's original Greek is preserved only in fragments, the remainder of the text is extant only in a Latin translation by Rufinus, who was a defender of Origen against posthumous charges of heresy. While Rufinus' translation is, as far as we can tell, faithful in most respects, there is ample evidence that he softened certain potentially troublesome passages in an ill-guided attempt to redeem his beloved teacher. When reading Origen's treatise, then, one would do well to keep this in mind should one stumble across seemingly contradictory passages, for one has no way of knowing what the original Greek might have said. The God and Father, who holds the universe together, is superior to every being that exists, for he imparts to each one from his own existence that which each one is; the Son, being less than the Father, is superior to rational creatures alone (for he is second to the Father); the Holy Spirit is still less, and dwells within the saints alone. So that in this way the power of the Father is greater than that of the Son and of the Holy Spirit, and that of the Son is more than that of the Holy Spirit, and in turn the power of the Holy Spirit exceeds that of every other holy being (Fragment 9 [Koetschau] tr. Butterworth 1966, pp. 33-34, and footnote). This graded hierarchy reveals an allotment of power to the second and third members of the Trinity: the Father's power is universal, but the Son's corresponds only to rational creatures, while the Spirit's power corresponds strictly to the "saints" or those who have achieved salvation. Such a structure of divine influence on the created realm is found much later in the system of the Neoplatonic philosopher Proclus (see J. Dillon, in G. Vesey, ed. 1989). According to Origen, God's first creation was a collectivity of rational beings which he calls logika. "Although Origen speaks of the logika as being created, they were not created in time. Creation with respect to them means that they had a beginning, but not a temporal one" (Tripolitis 1978, p. 94). Further, Origen explains that the number of these rational beings is necessarily limited, since an infinite creation would be incomprehensible, and unworthy of God. These souls were originally created in close proximity to God, with the intention that they should explore the divine mysteries in a state of endless contemplation. They grew weary of this intense contemplation, however, and lapsed, falling away from God and into an existence on their own terms, apart from the divine presence and the wisdom to be found there. This fall was not, it must be understood, the result of any inherent imperfection in the creatures of God, rather, it was the result of a misuse of the greatest gift of God to His creation: freedom. The only rational creature who escaped the fall and remained with God is the "soul of Christ" (Origen, On First Principles 2.6.5; Tripolitis 1978, p. 96). This individual soul is indicative of the intended function of all souls, i.e., to reveal the divine mystery in unique ways, insofar as the meaning of this mystery is deposited within them, as theandric (God-human) potentiality, to be drawn out and revealed through co-operation with God (On First Principles 2.9.2-8). As Origen explains, the soul of Christ was no different from that of any of the souls that fell away from God, for Christ's soul possessed the same potential for communion with God as that of all other souls. What distinguished the soul of Christ from all others - and what preserved Him from falling away - was His supreme act of free choice, to remain immersed in the divinity. What are now souls (psukhê) began as minds, and through boredom or distraction grew "cold" (psukhesthai) as they moved away from the "divine warmth" (On First Principles 2.8.3). Thus departing from God, they came to be clothed in bodies, at first of "a fine ethereal and invisible nature," but later, as souls fell further away from God, their bodies changed "from a fine, ethereal and invisible body to a body of a coarser and more solid state. The purity and subtleness of the body with which a soul is enveloped depends upon the moral development and perfection of the soul to which it is joined. Origen states that there are varying degrees of subtleness even among the celestial and spiritual bodies" (Tripolitis 1978, p. 106). When a soul achieves salvation, according to Origen, it ceases being a soul, and returns to a state of pure "mind" or understanding. However, due to the fall, now "no rational spirit can ever exist without a body" (Tripolitis 1978, p. 114), but the bodies of redeemed souls are "spiritual bodies," made of the purest fire (see A. Scott 1991, Chapter 9). Origen did not believe in the eternal suffering of sinners in hell. For him, all souls, including the devil himself, will eventually achieve salvation, even if it takes innumerable ages to do so; for Origen believed that God's love is so powerful as to soften even the hardest heart, and that the human intellect - being the image of God - will never freely choose oblivion over proximity to God, the font of Wisdom Himself. Certain critics of Origen have claimed that this teaching undermines his otherwise firm insistence on free will, for, these critics argue, the souls must maintin the freedom to ultimately reject or accept God, or else free will becomes a mere illusion. What escapes these critics is the fact that Origen's conception of free will is not our own; he considered freedom in the Platonic sense of the ability to choose the good. Since evil is not the polar opposite of good, but rather simply the absence of good - and thus having no real existence - then to 'choose' evil is not to make a conscious decision, but to act in ignorance of the measure of all rational decision, i.e., the good. Origen was unable to conceive of a God who would create souls that were capable of dissolving into the oblivion of evil (non-being) for all eternity. Therefore, he reasoned that a single lifetime is not enough for a soul to achieve salvation, for certain souls require more education or 'healing' than others. So he developed his doctrine of multiple ages, in which souls would be re-born, to experience the educative powers of God once again, with a view to ultimate salvation. This doctrine, of course, implies some form of transmigration of souls or metempsychosis. Yet Origen's version of metempsychosis was not the same as that of the Pythagoreans, for example, who taught that the basest of souls will eventually become incarnated as animals. For Origen, some sort of continuity between the present body, and the body in the age to come, was maintained (Jerome, Epistle to Avitus 7, quoting Origen; see also Commentary on Matthew 11.17). Origen did not, like many of his contemporaries, degrade the body to the status of an unwanted encrustation imprisoning the soul; for him, the body is a necessary principle of limitation, providing each soul with a unique identity. This is an important point for an understanding of Origen's epistemology, which is based upon the idea that God educates each soul according to its inherent abilities, and that the abilities of each soul will determine the manner of its knowledge. We may say, then, that the uniqueness of the soul's body is an image of its uniqueness of mind. This is the first inkling of the development of the concept of the person and personality in the history of Western thought. The restoration of all beings (apokatastasis) is the most important concept in Origen's philosophy, and the touchstone by which he judges all other theories. His concept of universal restoration is based on equally strong Scriptural and Hellenistic philosophical grounds and is not original, as it can be traced back to Heraclitus, who stated that "the beginning and end are common" (Fragment B 103, tr. J. Barnes 1987, p. 115). Considering that Origen's later opponents based their charges of heresy largely on this aspect of his teaching, it is surprising to see how well-grounded in scripture this doctrine really is. Origen's main biblical proof-text is 1 Corinthians 15:25-28, especially verse 28, which speaks of the time "when all things shall be subdued unto him [Christ], then shall the Son also himself be subject unto him that put all things under him, that God may be all in all" (KJV, my emphasis). This scriptural notion of God being "all in all" (panta en pasin) is a strong theological support for his theory of apokatastasis. There are, of course, numerous other passages in scripture that contradict this notion, but we must remember that Origen's strength resided in his philosophical ability to use reason and dialectic in support of humane doctrines, not in the ability to use scripture in support of dogmatical and anti-humanistic arguments. Origen imagined salvation not in terms of the saved rejoicing in heaven and the damned suffering in hell, but as a reunion of all souls with God. While Origen's lengthy treatise On First Principles contains numerous discussions of a wide variety of issues relevant to the Christianity of his day, as well as to broader philosophical concerns, certain key themes do emerge that are of universal and timeless value for philosophy. These themes are: free will; the educational value of history; and the infinity and eternal motion (becoming) of human beings. Origen's conception of freedom, as discussed above, was not the same as modern conceptions. This is not to say that his conception was wrong, of course. For Origen recognized freedom only in reason, in rationality, which is precisely the ability to recognize and embrace the good, which is for him God. Irrationality is ignorance, the absence of a conception of the good. The ignorant person cannot be held responsible for his ignorance, except to the extent that he has been lazy, not applying himself to the cultivation of reason. The moral dimension of this conception of freedom is that ignorance is not to be punished, but remedied through education. Punishment, understood in the punative sense, is of no avail and will even lead to deeper ignorance and sin, as the punished soul grows resentful, not understanding why he is being punished. Origen firmly believed that the knowledge of the good (God) is itself enough to remove all taint of sin and ignorance from souls. A 'freedom' to embrace evil (the absence of good) would have made no sense to Origen who, as a Platonist, identified evil with enslavement and goodness with freedom. The soul who has seen the good, he argued, will not fall into ignorance again, for the good is inspiring and worthy of eternal contemplation (see Commentary on Romans 5.10.15). Origen may rightfully be called the first philosopher of history, for, like Hegel, he understood history as a process involving the participation of persons in grand events leading to an eventual culmination or 'end of history'. Unlike mainstream Christian eschatology, Origen did not understand the end of history as the final stage of a grand revelation of God, but rather as the culmination of a human-divine (co-operative) process, in which the image and likeness of God (humanity) is re-united with its source and model, God Himself (see Against Celsus 4.7; On First Principles 2.11.5, 2.11.7; Tripolitis 1978, p. 111). This is accomplished through education of souls who, having fallen away from God, are now sundered from the divine presence and require a gradual re-initiation into the mysteries of God. Such a reunion must not be accomplished by force, for God will never, Origen insists, undermine the free will of His creatures; rather, God will, over the course of numerous ages if need be, educate souls little by little, leading them eventually, by virtue of their own growing responsiveness, back to Himself, where they will glory in the uncovering of the infinite mysteries of the eternal godhead (On First Principles 2.11.6-7). A common motif in Platonism during, before, and after Origen's time is salvific stasis, or the idea that the soul will achieve complete rest and staticity when it finally ascends to a contemplation of the good. We notice this idea early on in Plato, who speaks in the Republic (517c-d, 519c-e) of a state of pure contemplation from which the philosopher is only wrenched by force or persuasion. In Origen's own time, Plotinus developed his notion of an 'about-face' (epistrophê) of the soul resulting in an instant union of the soul with its divine principle, understood as an idealized, changeless form of contemplation, allowing for no dynamism or personal development (see Enneads 4.3.32, 4.8.4, for example). Influenced indirectly by Plotinus, and more directly by later Neoplatonists (both Christian and pagan), the Christian theologian St. Maximus the Confessor elaborated a systematic philosophical theology culminating in an eschatology in which the unique human person was replaced by the overwhelming, transcendent presence of God (see Chapters on Knowledge 2.88). Origen managed to maintain the transcendentality of God on the one hand, and the dynamic persistence of souls in being on the other. He did this by defining souls not by virtue of their intellectual content (or, in the Plotinian sense, for example, by virtue of their 'prior' or higher, constitutive principle) but rather by their ability to engage in a finite manner with the infinite God. This engagement is constitutive of the soul's existence, and guarantees its uniqueness. Each soul engages uniquely with God in contemplating divine mysteries according to its innate ability, and this engagement persists for all eternity, for the mysteries of the godhead are inexhaustible, as is the enthusiastic application of the souls' intellectual ability. Throughout this article, Origen's importance has largely been linked to his melding of philosophical insights with elucidations of various aspects of the Christian fatih. Yet his importance for Hellenistic philosophy is marked, and though not quite as pervasive as his influence on Christian thought, is nevertheless worth a few brief remarks. His role in the formation of Christian doctrine is more prominent, yet, because of its problematical nature, will be treated of only briefly. Origen's debt to Hellenistic (Greek) philosophy is quite obvious; his influence on the development of later pagan philosophy is - at least from the perspective of most contemporary scholarship - rather less obvious, but it is there. His trinitarian doctrine, for example, consisted of a gradation of influence beginning with the Father, whose influence was of the most general, universal kind, binding together all things; the influence of the Son extended strictly to sentient beings; the Holy Spirit's influence extended only to the 'elect' or saints who had already achieved salvation (Dillon, in D.J. O'Meara, ed., 1982, p. 20; see also On First Principles 1.3.5). This conception found later expression in Proclus' Elements of Theology (Proposition 57), where he elucidates this formulation: "Every cause both operates prior to its consequent and gives rise to a greater number of posterior terms" (tr. Dodds). For Origen, the pre-existent souls, through their fall, gave rise to a history over which both the Father and the Son came to preside, while the Holy Spirit only enters into human reality to effect a salvific re-orientation toward God that is already the result of an achieved history. The Holy Spirit, then, may be understood as the final cause, the preparatory causes of which are the Father and Son, the mutual begetters of history. A bit later, the pagan philosopher Iamblichus reversed this Origenian notion, claiming that the influence of the divine became stronger and more concentrated the further it penetrated into created reality, extending in its pure power even to stones and plants. In this sense, the Holy Spirit, limited as it is (according to Origen) to interaction with the saints alone, gives way to the universal power of the Father, which extends to the furthest reaches of reality. Iamblichus saw no reason to divide the divinity into persons or emanative effects; rather, he saw the divinity as operative, in varying degrees, at every level of reality. At the lowest level, however, this power is most effective, imparting power to plants and stones, and providing support for the theurgical practice advocated by Iamblichus (Olympiodorus, Commentary on Alcibiades I, 115A; Psellus, Chaldaean Expositions 1153a10-11; Dillon, ed. O'Meara 1982, p. 23). Origen's ideas, most notably those in the treatise On First Principles, gave rise to a movement in the Christian Church known as Origenism. From the third through the sixth centuries this movement was quite influential, especially among the monastics, and was given articulate - if excessively codified form - by the theologian Evagrius Ponticus (c. 345-400 C.E.). It is to be noted that the spirit of philosophical inquiry exemplified by Origen was largely absent from the movement bearing his name. A far more creative use of Origen's concepts and themes was made by Gregory of Nyssa (d. ca. 386 C.E. ), who adopted Origen's doctrine of apokatastasis or "restoration of all things." Gregory was also responsible for articulating more clearly than did Origen the notion that redeemed souls will remain in a state of dynamic intellectual activity (see Gregory of Nyssa, Catechetical Oration, esp. Chapters 26 and 35). After the posthumous condemnation of Origen (and Origenism) in the fifth century, it became increasingly difficult for mainstream theologians to make use of his work. Pseudo-Dionysius the Areopagite (5th or 6th Century C.E.) drew upon Neoplatonic philosophy, especially Proclus (411-485 C.E.) and Iamblichus (ca. 240-325 C.E. ), and though he followed in Origen's footsteps in this use of pagan wisdom, he never mentioned his predecessor by name. In the seventh century, Maximus the Confessor (ca. 580-662), who may be called the last great Christian Neoplatonist, set about revising Origen's doctrines in a manner more acceptable to the theological climate of the early Byzantine Church. Maximus changed the historicism of Origen into a more introspective, personal struggle to attain the divine vision through asceticism and prayer, the result being a total subsumption of the person by the godhead. This was Maximus' vision of salvation: the replacement of the ego by the divine presence (see L. Thunberg 1985, p. 89; also Maximus, Chapters on Knowledge 2.88). While there is much that may be called brilliant and even inspiring in Maximus' philosophical theology, this loss of the centrality of the person - as unique, unrepeatable entity - in the cosmic process of salvation led to the loss of a sense of co-operation of humanity and God, and sapped Christianity of the intellectual vigor that it displayed in the period leading up to the establishment of a theocratical Byzantine state. Thankfully, Origen's legacy was not lost. He was an inspiration to the Renaissance Humanists and, more recently, to certain Existentialist Christian theologians, notably Nicolas Berdyaev (1874-1948) whose insistence on the absolute autonomy and nobility of the person in the face of all objectifying reality is an echo across the ages of the humanism of Origen. Berdyaev himself admits Origen's influence on his thought (as well as that of Gregory of Nyssa) and insists that the doctrine of hell and the eternal suffering of sinners is not compatible with authentic Christianity. He also places a great importance on history, and even broaches a modern, de-mythologized conception of metempsychosis in terms of a universal, shared history of which all persons are a part, regardless of their temporal specificity. History, according to Berdyaev (and in this he follows Origen) binds all of humanity together. No soul will be saved in isolation; all must be saved together, or not be saved at all. Berdyaev wrote numerous works, a few of the most important are Slavery and Freedom (Eng. tr. 1944), The Beginning and the End(Eng. tr.1952), and Truth and Revelation (Eng. tr. 1962). Origen was an innovator in an era when innovation, for Christians, was a luxury ill-afforded. He drew upon pagan philosophy in an effort to elucidate the Christian faith in a manner acceptable to intellectuals, and he succeeded in converting many gifted pagan students of philosophy to his faith. He was also a great humanist, who believed that all creatures will eventually achieve salvation, including the devil himself. Origen did not embrace the dualism of Gnosticism, nor that of the more primitive expressions of the Christian faith still extant in his day. Rather, he took Christianity to a higher level, finding in it a key to the perfection of the intellect or mind, which is what all souls are in their pure form. The restoration of all souls to a purely intellectual existence was Origen's faith, and his philosophy was based upon such a faith. In this, he is an heir to Socrates and Plato, but he also brought a new conception into philosophy - that of the creative aspect of the soul, as realized in history, the culmination of which is salvation, after which follows an eternal delving into the deep mysteries of God. Origen, Against Celsus, tr. F. Crombie (The Ante-Nicene Fathers 4; Michigan: Eerdmans 1979, reprint). Origen, On First Principles, tr. G.W. Butterworth (New York: Harper and Row 1966). Origen, Commentary on John, tr. A. Menzies (The Ante-Nicene Fathers 10; Michigan: Eerdmans 1978, reprint). Origen, Commentary on Matthew, tr. J. Patrick (The Ante-Nicene Fathers 10; Michigan: Eerdmans 1978, reprint). Origen, Commentary on the Epistle to the Romans (Books 1-5), tr. T.P. Scheck (Washington, D.C.: The Catholic University of America Press 2001). Origen, Commentary on the Epistle to the Romans (Books 6-10), tr. T.P. Scheck (Washington, D.C.: The Catholic University of America Press 2002). Berdyaev, Nicholas, The Beginning and the End, tr. R.M. French (New York: Harper and Brothers 1952). Berdyaev, Nicholas, Slavery and Freedom, tr. R.M. French (New York: Charles Scribner's Sons 1944). Berdyaev, Nicholas, Truth and Revelation, tr. R.M. French (New York: Collier Books 1962). Chadwick, H., Early Christian Thought and the Classical Tradition: Studies in Justin, Clement, and Origen (New York: Oxford University Press 1966). Crouzel, H., Origen: The Life and Thought of the First Great Theologian, tr. A.S. Worrall (T.&T. Clark Ltd. 1989). Dillon, J.M., The Middle Platonists(Ithaca: Cornell University Press 1977). Hardy, E.R., Christology of the Later Fathers (Philadelphia: The Westminster Press 1954). Jonas, H., "Origen's Metaphysics of Free Will, Fall, and Salvation: A 'Divine Comedy' of the Universe," in Philosophical Essays: From Ancient Creed to Technological Man (Englewood Cliffs, NJ: PrenticeHall 1974). Kannengiesser, C., Petersen, W.L., eds., Origen of Alexandria: His World and His Legacy (Indiana: University of Notre Dame Press 1988). Kelly, J.N.D., Early Christian Doctrines (New York: Harper and Row 1978). Louth, A., Maximus the Confessor (New York: Routledge 1996). Luibheid, C., Rorem, P., tr., Pseudo-Dionysius: The Complete Works (Mahwah, NJ: Paulist Press 1987). Meyendorff, J., Christ in Eastern Christian Thought (Crestwood: St. Vladimir's Seminary Press 1975). Murphy, F.X., "Evagrius Ponticus and Origenism," in R. Hanson and H. Crouzel, ed., Origeniana Tertia (1981). O'Meara, D.J., ed., Neoplatonism and Christian Thought (New York: State University of New York Press 1982). Pelikan, J., Christianity and Classical Culture: The Metamorphosis of Natural Theology in the Christian Encounter with Hellenism (New Haven: Yale University Press 1993). Pelikan, J., The Christian Tradition: A History of the Development of Doctrine, vol. 2: "The Spirit of Eastern Christendom (600-1700) (Chicago: University of Chicago Press 1974). Scott, A., Origen and the Life of the Stars: A History of an Idea (Oxford: Clarendon Press 1991). Shaw, G., Theurgy and the Soul: The Neoplatonism of Iamblichus (University Park: Pennsylvania State University Press 1995). Siorvanes, L., Proclus: Neo-Platonic Philosophy and Science (New Haven: Yale University Press 1996). Stevenson, J., ed. A New Eusebius: Documents Illustrative of the History of the Church to A.D. 337 (London: S.P.C.K. 1957). Tatakis, B., Byzantine Philosophy, tr. N.J. Moutafakis (Indianapolis: Hackett 2003). Thunberg, L., Man and the Cosmos: The Vision of St. Maximus the Confessor (Crestwood, NY: St. Vladimir's Seminary Press 1985). Trigg, J.W., Origen: The Bible and Philosophy in the Third-century Church (Atlanta: John Knox Press 1983). Werner, M., The Formation of Christian Dogma, tr. S.G.F. Brandon ( Harper and Brothers 1957). Williamson, G.A., tr., Eusebius, The History of the Church (New York: Penguin Books 1965).